The lecturer, Amity Shlaes, has not only written a well-received biography of Coolidge, but also a revisionist history of the Great Depression that should be must reading. Eric Holder has politicized the Justice Department in a way not seen since the scandals of Nixon appointee John Mitchell. Holder’s prior ethical lapses – notably, as deputy attorney general in the Clinton administration, the disreputable eleventh-hour pardon for fugitive (and Democratic contributor) Marc Rich — were well known. But in less than six years, he has managed to trump them. Holder was held in contempt by Congress for withholding subpoenaed documents about the Fast and Furious scandal, and he editorialized on pending criminal cases, such as the Trayvon Martin and the Ferguson cases. He arbitrarily chose not to enforce existing laws, whether elements of Obamacare or immigration statutes. He was forced to pay back the government for using a Gulfstream to junket to the Belmont Stakes with family and friends. He sought to try terrorists in civilian courts, and he demonized the idea of Guantanamo, which earlier, when it was politically expedient, he had praised. He caricatured his critics and made race essential rather than incidental to his tenure (e.g., “my people,” “nation of cowards,” and the false charges of racism against critics of the administration) in a way that would have gotten anyone else fired. Had any other attorney general monitored reporters’ communications as Holder did those of AP reporters, and, even more so, James Rosen, he would also have been summarily dismissed. Even the media will not be able to prevent Holder’s legacy from being seen as one of the Justice Department’s no longer enforcing the law without prejudice, but instead choosing haphazard compliance in order to advance partisan ideas of social justice. Why, yes. I did pick this example because of my particular loathing for Eric Holder. I admit it: I’m weak. Anyway, as Hanson says, Obama’s multiple scandals and numerous incompetent appointments dwarf anything that went on under Harding, even the infamous Teapot Dome scandal. Obama has set the standard that the purpose of government is to facilitate his version of social change, regardless of protocols, laws, or traditions. And the result is a scandal-ridden administration that exceeds that of Warren G. Harding — one that has now convinced the public that their government agencies are not lawful, competent, or to be trusted. The Obama administration was the moment progressives had dreamed up since FDR passed away. But, instead drawing people to the Great Liberal Cradle To Grave Paradise, it will more likely send them screaming in the other direction. At least, so we hope. (1) Which can be said about pretty much anything VDH writes. PS: An example of how Harding succeeded where Obama failed. Not in the sense of “after him, a civil war,” of course. That line of thinking, which I’ve occasionally seen, is a bit overwrought. But something Stanley Kurtz wrote today made me think of Jimmy B. And so it is with Obama and whoever succeeds him. There’s been a controversy… well, not “raging,” but always there in the background, about whether Senators Marco Rubio and Ted Cruz, and Governor Bobby Jindal are eligible to serve as President of the United States based on the Constitution’s “natural born” clause. It’s the modern version of the controversies surrounding the candidacies of Barack Obama and John McCain. Heck, it’s been “in the air” since the presidency of Chet Arthur (1), who was accused of being born in Canada. The arguments that the term “natural born Citizen” excludes Rubio and Jindal (because their parents were not citizens) or Cruz (because he was born abroad to a citizen mother only) at most raise doubts. Those doubts, however, never rise anywhere near the level of making the case that Rubio, Jindal and Cruz are excluded. Most of the counter-arguments are historical conjecture, at best, and rely on speculation not connected to the text of the Constitution or any demonstrable actual intent or understanding of the Framers. In the circumstance of candidates who appear to qualify based on the text of the Constitution and the traditions upon which “natural born Citizen[ship]” is believed to derive, and as to whom there are at worst some doubts raised, I believe the proper constitutional outcome is to leave the issue to the political process. To exclude apparently eligible candidates based on speculation as to what the term “natural born Citizen” might have meant is no better, and I would argue much worse. Remember, these are merely eligibility requirements, not requirements that a person be elected. It would be consistent with the Framers’ demonstrable concerns to consider loyalty to the United States as a political factor, even if not absolutely legally disqualifying. If you don’t trust the loyalty of a candidate because of how he or she became a “natural born Citizen,” don’t vote for the person. Like I said, it’s a long post, but well-worth your time if you’re interested in the topic. Now, if only we could find a necromancer to bring Reagan back…. (Or, for science fiction fans, cloning.) Regardless, his current successor makes me realize how starkly better a president the Gipper was. Barack Obama has stated that he wants to be like Reagan, at least in the sense of wanting to be a transformational figure. But almost certainly he has failed. Yes, Obama has increased the burden of government spending, raised tax rates, and created more dependency, but there’s nothing particularly special about Obama’s tenure that makes him different from other statist Presidents such as Nixon, Carter, and Bush. Nor is there any evidence that he has fundamentally changed the attitudes of the American people. That may sound like a bold – and overly optimistic – assertion, but check out the amazing results from a new poll. 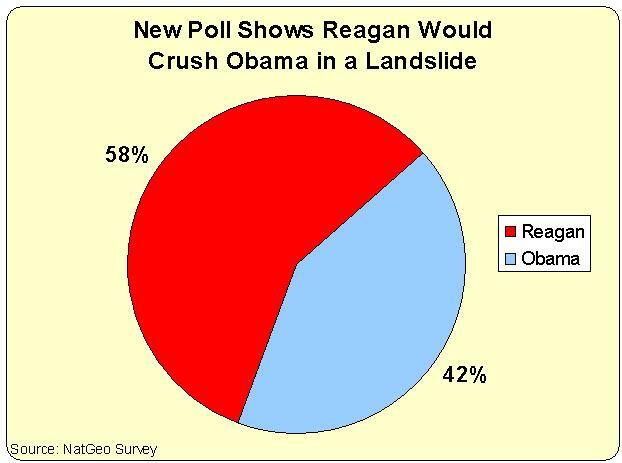 According to a survey of 1,000 adults, Reagan would kick the you-know-what out of Obama, winning a hypothetical contest by a staggering 58-42 margin. You are currently browsing the archives for the US Presidents category.